A few weeks ago, I was privileged to attend the National Association of Nutrition Professionals (NANP) Annual Conference & Expo in Tucson, Arizona. 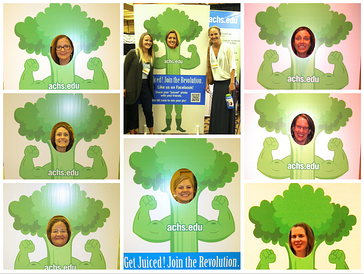 The ACHS team and I (including Mr. Celery man, pictured below!) had so much fun “getting juiced” with all the holistic nutrition students, professionals, and educators at the conference! Surrounded by so many experts at the conference and expo, I started thinking about how valuable the NANP is to our holistic nutrition students and alumni—especially their Holistic Nutrition Credentialing Board (HNCB). One of the best ways to get involved with this organization is through their annual conference. The NANP Conference is a priceless experience as a holistic nutrition student. You should attend at least once during your academic career at ACHS. As an educator at a distance learning holistic health college, it’s a joy to connect with ACHS students and alumni at conferences and events. I was able to snap a photo with graduate, Hillary Carroll (below), who did a phenomenal job organizing and facilitating the conference as an NANP volunteer. Dean of Admissions Amy Swinehart also caught up with current student Maria Castro (Diploma in Holistic Health Practice) to talk about her goals and aspirations in holistic health. Maria’s passion is truly inspiring, and she has wonderful tips for prospective and current students. Watch her video interview at the bottom of this post or here: NANP Interview with ACHS Student Maria Castro. We’d love to see you at the next Conference & Expo, so mark your calendars today for May 1-3, 2015! ACHS will be a Platinum Sponsor, so please come stop by the booth, chat with us, and snap a photo if you’re in attendance. NANP offers more than their conference. It is an immensely valuable resource for holistic nutrition students. I am incredibly proud of how they foster growth and collaboration in the holistic health industry. Membership with the NANP comes with fantastic perks, including a number of discounts to services that can keep you connected and help grow your current or future holistic health career. Read about all the NANP membership benefits here. Looking for a summer internship (like Hillary!) or your first job after graduation? As a member, you can browse their career listings page and get a jump on those applications. 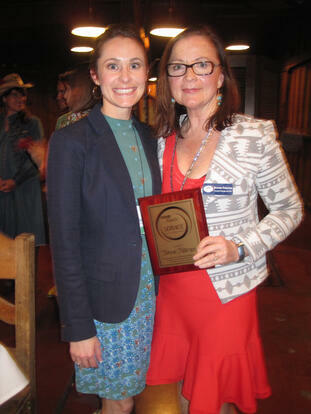 Already an NANP member? Start browsing jobs and internships here: NANP Jobs and Internships. I can’t emphasize enough how important the HNCB is for a career in holistic nutrition. The HNCB is a credentialing body that offers a comprehensive, knowledge-based examination to holistic nutrition graduates. This credential promotes an educated, responsible, and nationally recognized community of holistic nutrition experts. Board certification is a crucial credential for any holistic nutrition professional. $300 exam fee (well worth the cost for this important credential). 70% grade is required to pass. Exam candidates are given three hours to complete the exam. NANP offers a helpful study guide along with the application, which you can find here: http://www.nanp.org/learning-resources-opportunities. The study guide costs $75, but it includes many helpful resources to help you prepare for your exam. Renew your credential every two years (with 30 continuing education credits (CEUs) required each renewal or 10 CEUs if you’re an NANP member). Read the full exam eligibility requirements here. If you’re on track to graduate with your holistic nutrition degree, certification, or diploma in the next year, I strongly encourage you to sit for this exam at the NANP Annual Conference & Expo in the spring (it is offered every year). ACHS is a Platinum sponsor for the 2015 conference, so while you’re at the Conference, don’t forget to stop by the ACHS booth and say hi! The exam is also offered throughout the year, so even if you can’t make the conference, you can sit for a proctored exam at another time! If you’re serious about a career in holistic nutrition, you’ll want this credential on your resume. You can read more about the HNCB exam here and review the exam eligibility requirements here. 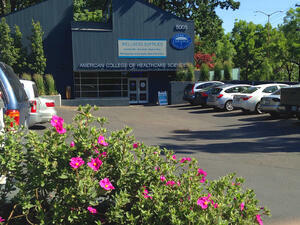 The Center is full of useful information for holistic nutrition students and professionals. The CNA offers up-to-date data on the nutrition and dietician practitioner laws and legislation by state. They also make tremendous efforts toward health freedom, so holistic nutrition professionals can legally and safely practice to the level of their education and expertise. As a student looking forward to a career in nutrition, this is a site you should review often. You might even consider getting involved with their cause. Laws and restrictions on holistic nutritionists can be extremely strict in certain states, and the CNA can help you stay on top of the crucial legislation you need to know and take action to ensure health freedom for consumers and practitioners in your state. Nutrition.gov is a valuable (albeit allopathically oriented) resource for finding the most recent information surrounding nutrition. Nutrition.gov is funded by the United States Department of Agriculture (USDA). You can find updated census data from the Center for Disease Control (CDC), information on food labeling, nutrition industry news, USDA Dietary Guidelines, and food safety. So, while nutrition.gov focuses on allopathic nutrition rather than holistic nutrition, it is still a useful resource for students to keep up to date with nutrition trends and research. We value every one of our students here at ACHS. Helping our students and graduates succeed is one of our greatest pleasures. I encourage you to get active outside your ACHS classrooms—utilize these resources to learn more and get involved in the holistic nutrition community. That way, once you graduate, you’ll be armed with an arsenal of credentials and knowledge that can help you take on the professional world! Which one of these resources do you find most helpful? Tell me in the comments! Ready to join other great students like Maria? A holistic nutrition certification, diploma, or degree from ACHS can set you on the right path to achieving your goals in holistic nutrition. Find out more about our program offerings by clicking the image below. *Note that you must also be an NANP member and provide documentation of 500 hours (includes min. of 250 direct contact hours and up to 250 indirect contact hours) of professional experience in holistic nutrition. However, you can still sit for the exam without the professional experience hours, and you’ll receive a certificate marked “Candidate” which will be removed once you accrue your professional hours requirement.